The incessant rain notwithstanding, we’re almost into boating season. 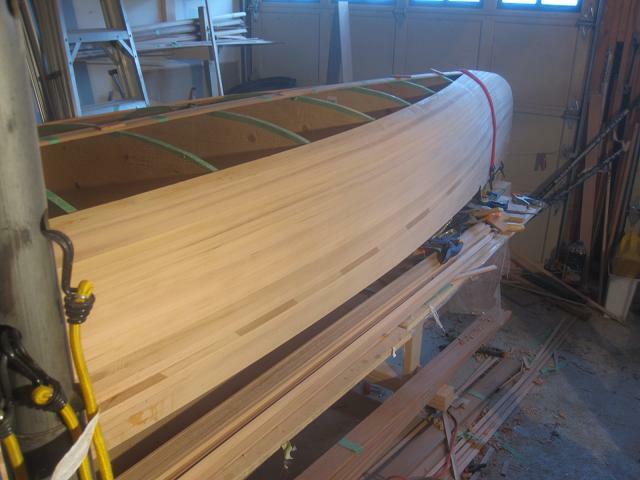 There were a few things that I hadn’t done to ready the kayak for its launch, one of which being the end pour. 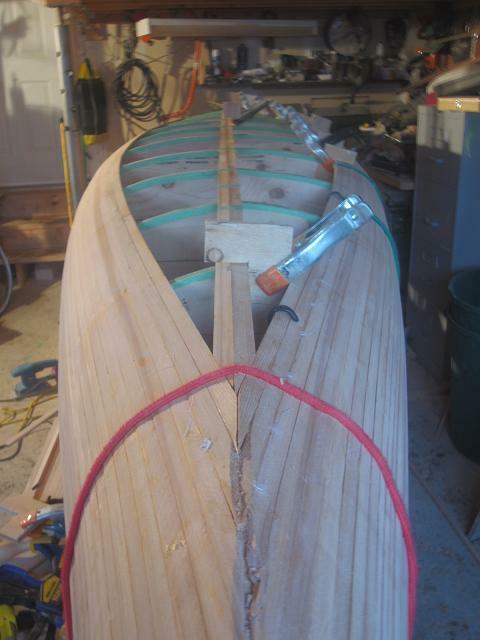 The purpose of the end pour is to reinforce the tips of the kayak, particularly because it is not possible to run the fiberglass tape into the ends, and to cause a visual distraction for anyone driving by. The end pour is achieved by standing the kayak on end, standing on a ladder, lowering a resin-filled container to the tip, and then overturning the container, thereby depositing the resin into the tip. What follows is the most enjoyable part of the process — enjoying a beverage while the resin hardens. Here’s the bit of information that I found difficult to find on the internet. I didn’t want overheated, liquid resin to fall on my head on flipping the boat, so I was curious about how long it would take for the resin to harden. Here are the details: I mixed 6 – 8 ounces of MAS epoxy with fast hardener. By the 10-15 minute point, the resulting goo was hot to the touch and after 30 minutes or so, the mixture had hardened. All in all, a perfect period of time to stand around and enjoy a beverage. At any rate, I’m just about done the accent strip, which consists of alternating light and dark western red cedar sandwiched between two strips of douglas fir. 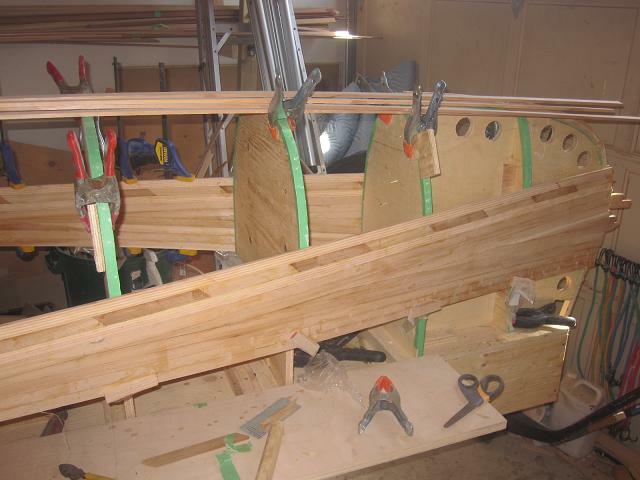 I’ll soon transition to bead and cove strips to more easily strip the curve of the bilge. 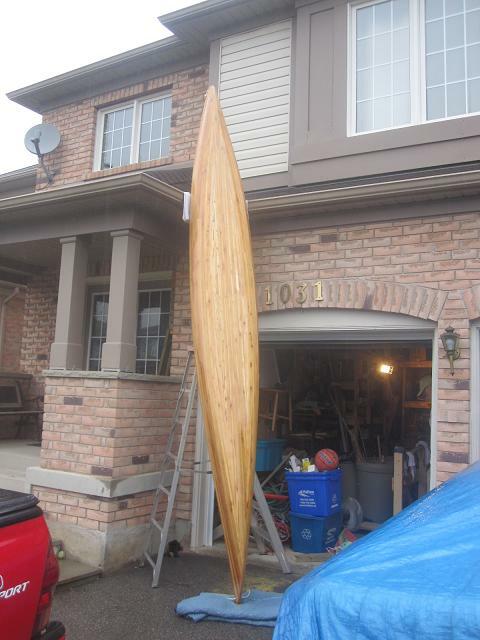 You are currently viewing the archives for May, 2011 at greybeard canoes & kayaks.